Now available from Australian Warehouse Solutions , Wulftec SML-150 pallet wrappers are the ideal machines for medium volume users. Wulftec semi-automatic SML-150 pallet wrappers have a factory set film pre-stretch of 250% and features an easy and fast film loading carriage. 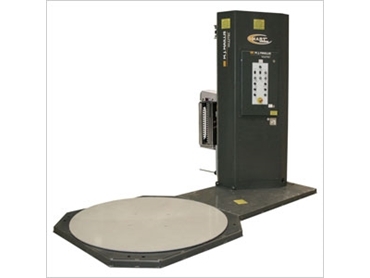 Features of the SML-150 pallet wrappers include such things as a load capacity of up to 1.8 tonnes as well as a large turntable to accommodate for a variety of pallet sizes. These pallet wrapping machines are housed in sturdy steel frames which offer a 10 year guarantee, ensuring that these pallet wrappers are suited to even the harshest environments. Alongside the 10 year guarantee, the Wulftec SML-150 pallet wrappers also feature an unprecedented 4 year unlimited cycle warranty. Other key product features of the Wulftec SML-150 pallet wrappers include a no-thread powered pre-stretch carriage; patented Lexan gate safety covers; double latch safety gate locks; and a maintenance free AC motor. All of these features result in the SML-150 pallet wrappers being virtually silent in operation, with all the components of the pallet wrappers easily accessible for maintenance by the user.